Peter Sauber outside the Sauber garage. The 2004 German Grand Prix was a Formula One motor race held at Hockenheim on 25 July 2004. It was the twelfth race of the 2004 FIA Formula One World Championship. The 66-lap race was won by local driver Michael Schumacher, driving a Ferrari. Schumacher took his eleventh victory of the season, equalling his record from 2002, after starting from pole position. Englishman Jenson Button finished second in a BAR-Honda despite a ten-place grid penalty for an engine change in practice, with Spaniard Fernando Alonso third in a Renault. This was the final Grand Prix for Brazilian driver Cristiano da Matta. The first start was aborted after Olivier Panis indicated a problem with his Toyota. This led to a second formation lap, and the shortening of the race by one lap. Kimi Räikkönen's rear wing failed during the race, leading to a massive accident. Marc Gené was replaced at Williams by Antônio Pizzonia, returning to Formula One after being sacked by Jaguar following the 2003 British Grand Prix. Pizzonia scored his first points by finishing seventh. ^ Although Michael Schumacher set a lap time of 1:13.306 in qualifying, Kimi Räikkönen's time of 1:13.780 is recognised as the lap record as it was set under race conditions. ^ "2004 German Grand Prix - Saturday Qualifying Results". Formula1.com. Formula1.com Limited. Archived from the original on 30 October 2013. Retrieved 27 December 2015. ^ "2004 German Grand Prix - Race Results". Formula1.com. Formula1.com Limited. Archived from the original on 16 November 2014. Retrieved 27 December 2015. ^ a b "Germany 2004 - Championship • STATS F1". www.statsf1.com. Retrieved 18 March 2019. 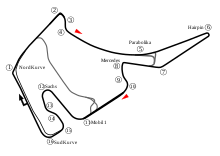 Wikimedia Commons has media related to 2004 German Grand Prix.